What’s a girl to do when it’s only breakfast time and she’s got a hankerin’ for chocolate chip walnut cookies? 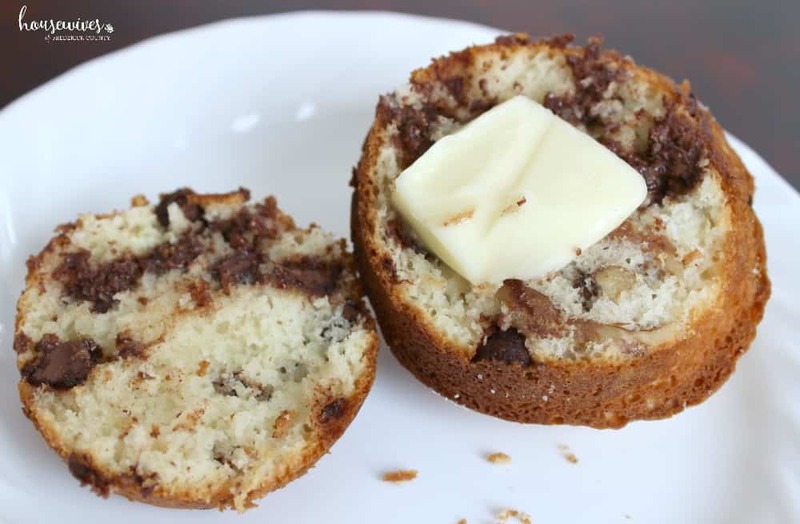 Make easy chocolate chip walnut cookie muffins!! 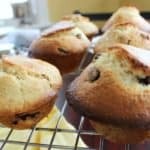 And if you’re looking for other delicious muffin recipes, check out my Banana Crumb Muffins and my Zucchini Quiche Muffins. I’m going to give you a little backstory first. See, my husband bought a HUGE bag of chocolate chips about a month and a half ago. They’ve been sitting in our pantry CALLING my name! Every night when I get the I-have-to-eat-something-sweet hunger pangs, and I swear they’re brought on by my mind and not my stomach, I reach into the pantry, pour a LITTLE bit of chocolate chips in a bowl and mix them with peanuts. It totally satisfies my sweet and salty snack craving. BUT it was happening way too often. Actually to the point where there was only about 1/3 of the BIG bag of chocolate chips leftover. Yes, I have a problem with food in the house calling my name. It is totally a thing though! Check out what WebMD has to say about it. So before my husband caught on that I had eaten through almost an entire large bag of chocolate chips over a relatively short period of time, I decided I’d make a batch of easy walnut chocolate chip muffins for breakfast. And now I’m the hero! This was a seriously easy chocolate chip muffin recipe and these little handheld mounds of goodness were delicious! They’re a little crispy on the outside with the added sugar on top and moist on the inside. 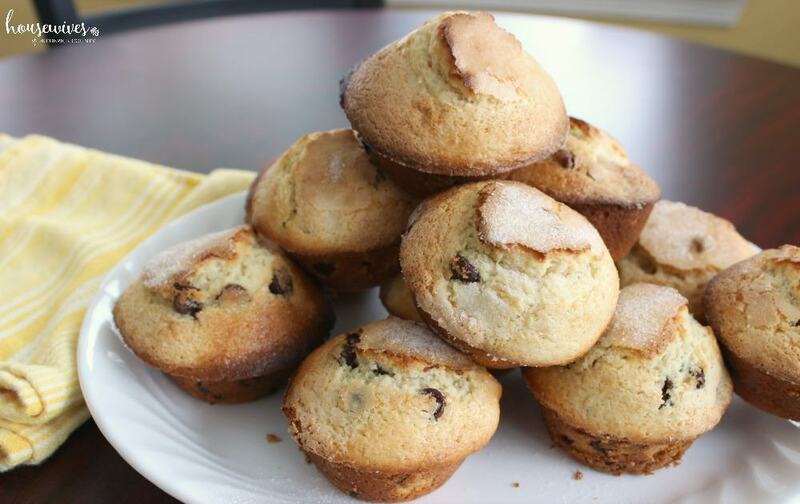 If you’re a walnut girl like I am, you’ll love them in these chocolate chip muffins! I buy the whole walnuts, not chopped, and just throw them right into the mix. In a large mixer bowl, mix the eggs, sugar, and vanilla on high speed until thoroughly combined. In a small bowl mix together melted butter and vegetable oil. Slowly pour the butter/oil mixture into the egg mixture on medium speed. In a small bowl, mix together the half and half, milk, and lemon juice. Then slowly add that mixture to large mixing bowl at medium speed. Add dry ingredients and mix by hand, but do not over mix. 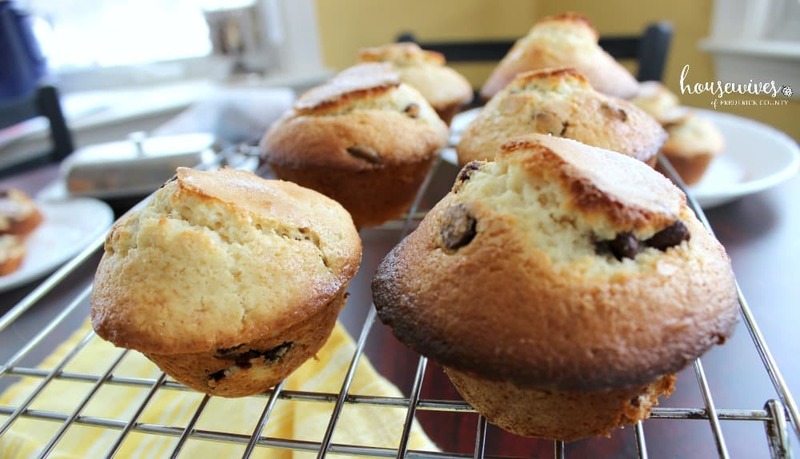 Spoon batter into well greased muffin tins, filling them to the top. 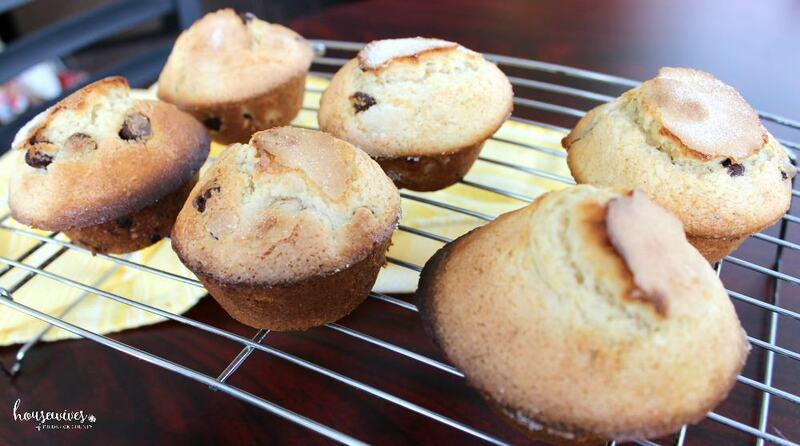 Sprinkle a little bit of granulated sugar on top of each muffin. Bake in preheated 400 degree oven for 20 to 25 minutes or until a wooden toothpick inserted into the center of the muffin comes out clean. Don’t let their look fool you! They’re so inviting but very filling. I could only eat two for breakfast and I was full. And while you’re at it, get yourself a good mixer to make life that much easier, especially on your mixing arm! You totally deserve it after slaving in the kitchen! Here’s one from Amazon that’s gotten over 7,500 reviews averaging over 4 1/2 stars. They were so good that between my husband, son, and me, all 12 of them were gone within a matter of days. And so far, my husband hasn’t asked whatever happened to that huge bag of chocolate chips. What recipes do you make with a half opened bag of chocolate chips?